thoughts » Google Apps. Goodbye Outlook. You learn something new everyday. I have owned my domain davejunia.com for nearly 8 years now and have only realized that I could have made the switch to Google Apps to run my email. Obviously, I did. I had my first email back in 2000. That was the year a friend of mine introduced me to the internet. I was using Windows ME at that time with a Pentium III 1Ghz CPU and had never used the internet. The exposure to the internet made me want to ensure that I had a place in this brand new world. And so I went to over 10 email providers to register for my name. I must have over 15 email address at one point with domains such as email.com, lycos, hotmail, yahoo and the like. I am glad I was exposed to the intenet pre Google. At that point I was searching using Yahoo and Altavista. Google came in about one to two years later. And the rest is history. What made Gmail dominant was its speed. We’re talking early 2000 here and most web applications were either simple and fast or complex and janky. At that point the battle was for features and most email providers attempted to incorporate RSS feeds, widgets and the like causing their email interface to be rather slow. Google took the stripped down approach with most of their services. Search was nearly straightforward text. Emails were the same. I came on the Google bandwagon a little late, always erring on the side of caution as usual. It used to be hotmail as a default provider due to their instant messaging dominance. Everyone in school was on hotmail and it remained so for a good part of the 2000s. It is actually a little shocking on my end to realise that most of my friends have moved away from hotmail and MSN (then) Messenger. I am not a IM whore but these were the people that spent hours on it. 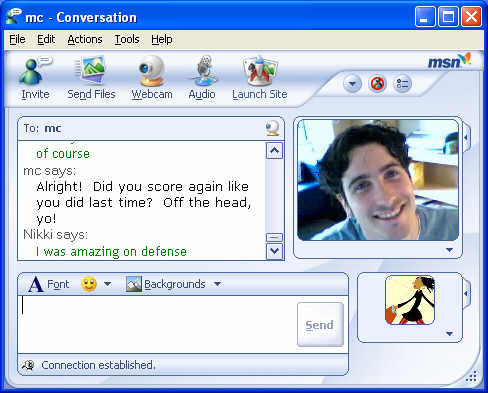 MSN Messenger - Remember this? I took a Google account for formalities at first. Again, the usual attempt to bookmark ‘dave’ ‘junia’ ‘lum’ on the web at every opportunity. In a sense I wanted to be the only ‘junialum’ on the web and it has been going well so far because of the rather unique combination. I got a Google account a little before I bought my own domain. So the transition was from hotmail to davejunia.com. Gmail’s reliability made me choose it as a backup email for my davejunia account. Google expanded its reach to YouTube and I had to more regularly use my Gmail account for that. Most of my YouTube posts are unlisted videos. I have a few 2000+ views videos that are gaming related and remain firmly in the gaming realm only. Identity remains very important to me and even though Gmail was fast becoming the preferred email provider I stood firmly by my domain’s namesake. My primary use for the domain was email and a largely static site. The presence of my domain was also fast becoming a selling point of my skills and experiences especially in the tech side of things. At that point I was dabbling in design and have won awards and more importantly job contracts to build sites or handle graphic design for firms and some NGOs. Having a domain boosted my professional credentials even though I was largely amateurish at that time. The problem with email on my domain whichever the provider was the poor webmail interface. Cpanel uses 3 different clients that you can choose from and most of them were barebones. It reminds you of a mid 1990s client. It was that bad and there has been no change basically because Cpanel is a basic service whose main aim is to handle server side commands rather than provide a pretty web interface. It was because of this that I began to rely heavily on Outlook. In fact it the webmail interface was so unbearable I only used it in a worse case scenario. I started off using POP3 and then moved on to IMAP when I needed mail synchronization over 3 devices. It was at this point I began to run domains for startups and also for family. These were non geeks and presenting them a really rundown non user friendly interface was not an option. I talked to my former system administrator who told me that there wasn’t anything he could do about it. So I went on to configure Outlook for all my users. A painful non sustainable process. Verify you own the domain either by uploading a simple file or doing a CNAME change. Change MX Entry settings so that you allow Google to take over mail receiving and sending while disabling CPanel’s. Do optional CNAME changes so that mail.yourdomain.com / calendar.yourdomain.com / docs.yourdomain.com points to Google Apps. It takes only 5 minutes to setup and there is sufficient customization available to embed your domain’s feel into Google Apps. Google also provides clear documentation on how to make the change. Best of all its free for under 10 users per domain and it gives about 7GB storage for each account which is more than anyone should need. Needless to say I’m off Outlook finally. My former post detailed how I moved my calendar and contacts to Gmail. I have now moved them to my own domain as Google Apps functions more like an Exchange server with the exact same capabilities as Gmail. So the migration is done and dusted. So long Outlook, hello cloud!